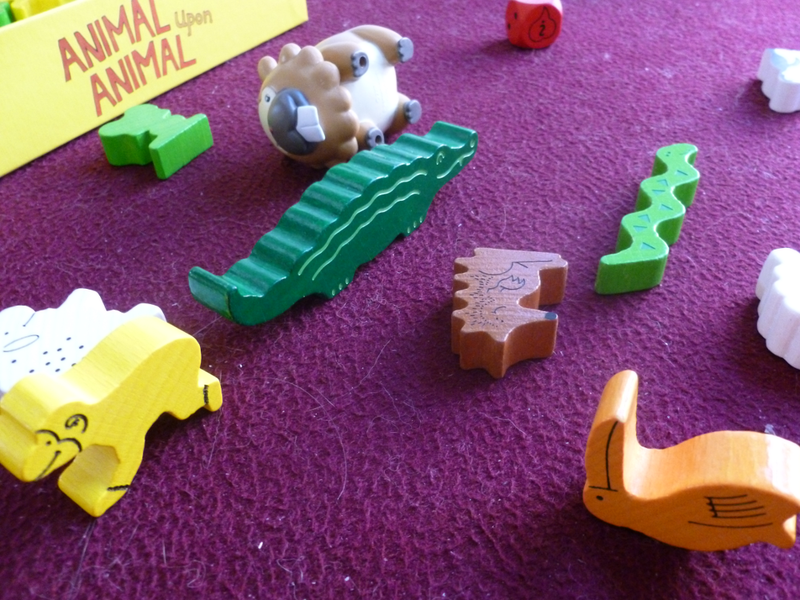 Animal Upon Animal is a very light dexterity game where you balance wooden animals on top of each other. 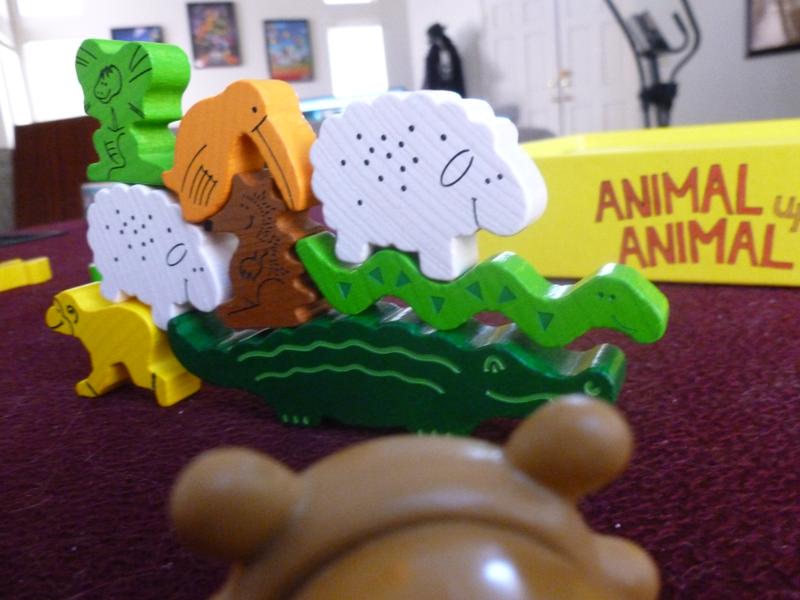 You roll the dice to determine what you have to do on each turn, and the first person to successfully balance all their animals wins! Stack ’em high! Not shown: the penguin piece. Bidoofs may or may not act as reasonable substitutes (hint: not). 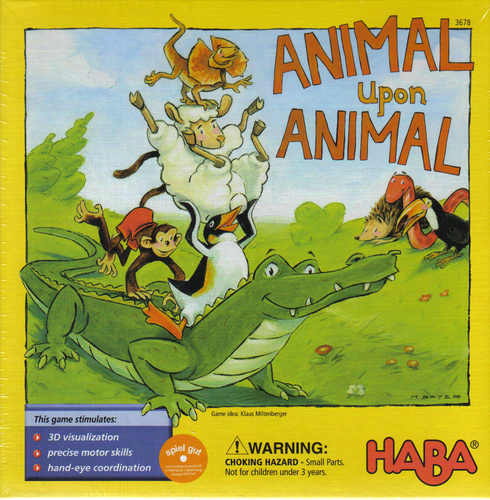 Since actions are all based on a roll of the die, it’s a very lucky game, especially with two players – it really comes down to rolling the “place two” or the “hand off” symbol (where you give the other player one of your animals to balance). Despite this, I really enjoy the game because it plays very fast with two and you can pretty much spam games to even out the luck. The game sets up and cleans up quick so it’s a great game for when you don’t have a lot of time. The pieces are also great quality, made of a nice, chunky wood. This is good for playing with kids or if you want to play outside (as long as you have a flat surface or want to play Hard Mode). The pieces definitely seem like they can take a beating and last a long time. A full pyramid collapse. Sadly, only the monkey survived. We got this game after looking for games to play before bedtime – games that played fast and required less thought than say, Hanabi, to let our brains relax before sleepytime. I feel like it’s great for this or any situation that’s similar, like playing with young children or people adverse to learning more than a few rules. It’s also very portable, and if you don’t want to carry the box around, you can always put them in baggies to maximize their ability to squish into irregular places. In all, a short and sweet game that’s great for situations where you just don’t want to think hard. Highly recommended if you need something for this niche!